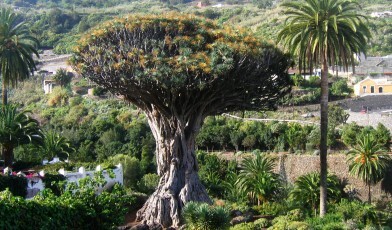 The Canary Islands dragon tree, like its close relative, the Socotra dragon tree, is a member of the asparagus family. It is well known for its striking umbrella like appearance and has long been used and valued by people living within its natural range and by those living further afield in the Mediterranean. The Guanche people of the Canary Islands used the sap in their mummification processes. In Ancient Rome, ‘sangre de drago’ was used as a colorant. Across Europe it has been used as a varnish and anti-oxidant for iron tools. The tree also played a role in the Greek myth: “The Eleventh Labour of Hercules: The Apples of the Hespérides”. After Landon, a hundred-headed dragon, is slain, red blood flowed out upon the land and from it sprung up the trees that we now know as ‘dragon trees’. The tree once played an important ecological role. Approximately five hundred years ago the fruit of the dragon tree was the staple food of an endemic, Dodo-like, flightless bird that is now extinct. The processing of dragon tree seeds through the digestive tract of this bird helped stimulate germination and it is possible that the loss of this bird species has led to a decline in naturally occurring dragon trees. The tree is becoming very rare and seed must be manually processed in order to germinate. In Cape Verde, the species is protected under national law from picking and uprooting. The creation of a network of protected areas is in progress, potentially offering a refuge for some of the species’ populations. Collections of this species can be found in botanic gardens and arboreta, providing an important genetic resource for potential restoration efforts. Profile based on information kindly provided by Hugh Synge, Plant Talk and by Teresa Leyens, Cape Verde Islands, July 2000. ‘Dragon blood’, a resin from the Socotran Dragon tree (Draceana cinnabari), was used and traded by the Roman empire as a medicine as early as the 1st Century BC. Read more about trees with medicinal values.